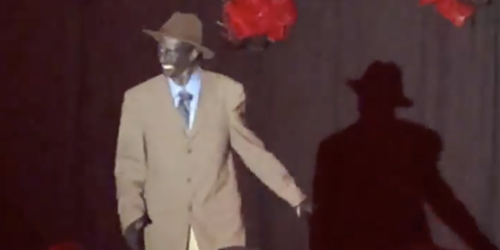 Blackface, a racist minstrel-age throwback where performers blacken their faces to mock African-Americans, has been condemned for decades, but some white people just can’t seem to give it up. Whether it’s for Halloween or a “performance,” anyone with the IQ of a snail knows that it is incredibly offensive and should never be done. Everyone, that is, except for one dull-witted drag king in Hawaii. Kauai Beach Resort hosted “A Show Fit for a Queen” last week and while most performers were your standard drag queens, the special guest was “male impersonator Muddy, the King of Memphis.” Perhaps his name should be King of Dumbassery. A short clip of the performance was uploaded to Facebook and, while the person who posted it says Muddy was quickly yanked off stage, organizers are scrambling to distance themselves from the disaster. Matt Sagum, who promoted the show, has responded, saying he was the person who got Muddy yanked off stage. “I arrived 20 minutes late. When I got backstage I didn’t notice her at first. Once I got settled in, I looked up and saw. One of the other Queens pulled me aside and was like ‘wtf is that?! To which I had no response other than ‘that is not going to fly’,” Sagum wrote. Former Today Show host Megyn Kelly lost her job with NBC recently when she defended blackface on the program. 2018: Drag King just came out in black face…WTF Hawaii?! ?Update: A lot people with questions. I have no idea what organizers knew ahead of time. This was not at a bar, some event space for the fundraiser. The organizers did cut the spotlight and music about 45 seconds into their performance. It looked like this person had two other numbers on the set list but they cut them from the show.